Here is an almost worst case scenario for a t-shirt printing company: Giants cancel order for Melky Cabrera T-shirts for fan giveaway "The San Francisco Giants canceled an order for 20,000 Melky Cabrera T-shirts just in time. Giants spokeswoman Staci Slaughter said Tuesday that the order was stopped just before printing after Cabrera received a 50-game suspension from Major League Baseball last Wednesday following his positive test of testosterone. " It doesn't get much worse than that. Just the restocking fee would kill me, plus the cost of transporting the shirts to the print shop. Bummer Dude. I am mostly worried about the poor, poor Milk Maids, girls who go the Giant's Games dressed as Dairy Chicks. What are they going to do with their outfits? What has changed in the t-shirt world? Every day I get up and do the same thing, look at artwork, place t-shirt orders, check inventory and so on. Sometimes I think it is going to be different today, something is going to happen to make t-shirts come alive and print themselves. Or my designs are going to get inducted into the Museum of Modern Art in some large international city. Maybe I will get a huge order from a mainstream company that I can work on for the rest of my life, maybe, maybe not. Nothing changes that fast and nothing has been significantly different for a few years. 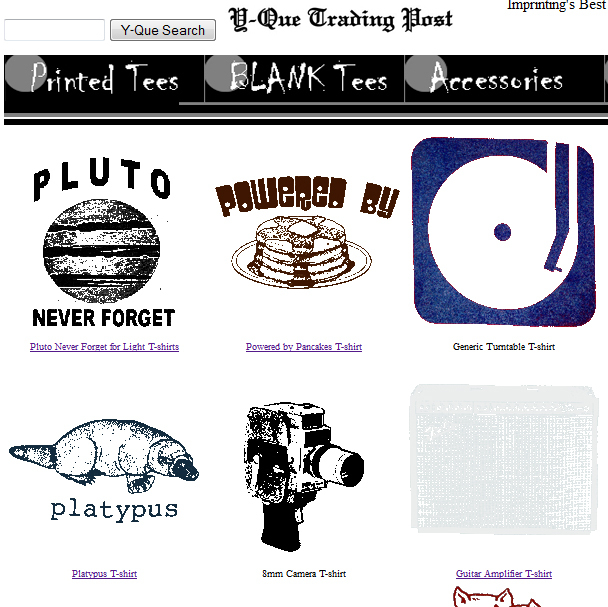 I have expanded my collection of fitted t-shirts on yque.com and blanktshirt.com, no biggie. The prices have come down a bit to the $4-5 range for a decent Next Level 3600 fitted t-shirt. V-necks have come into fashion in a strong way, but not for huge custom orders. I've been playing with spray paint stencil designs, but nobody is really a fan of that except me. Prices have gone up a bit due to some droughts, but have come back down this year. I would be surprised to see a rise in prices next year if the drought in the United States hits the cotton crop. Other Markets and Why Aren't Trade Shows Outdated? Trade shows are outdated, but I still feel the need to go to them every now and again as both a buyer and seller. There are other markets these days like eBay, Etsy or even your own website, but the fashion business still seems to be stuck in 2nd gear and thousands of people march around the world to trade shows all year around in the hopes of finding something somebody else hasn't already found. The money and expense of the booth, the travel and the display all add to the cost of these products. When the internet was evolving, I thought trade shows would die out quickly, but instead they are dying a slow agonizing death. The internet has not completely replaced the tactile nature of picking up and seeing products first hand, but still there are fewer and fewer people attending most trade shows as buyers and sellers. Some trade shows have closed, like the Action Sports show that used to be in San Diego. It was a paradise of bikini models and free stickers from all the trendy skateboard companies vying for attention. This was more of a party than a trade show, so it was only a matter of time for this type of wasteland to go away, but I do miss it now that it's gone. eBay has been a big let down as a place to sell wholesale as the prices that they charge are too expensive to maintain and the customers don't really buy in a large volume. I tried selling stuff on eBay for a few years and the fees just got higher and higher, then they purchased paypal and things got worse, not better. Double dipping is what I call it as they make money from the sale and the transaction, which ends up costing both the consumer and seller in the form of higher prices. Then the cycle continues as higher prices mean lower volumes until everything is retail. Etsy seemed to be like a place where fun stuff could be sold, but again, it ends up being more retail than wholesale types of transactions, if any transactions are made. The format is interesting, but without some sales that convert it seems like a showcase for quirky things. Amazon is another good idea that has turned into a monster. I worked with their marketplace and attempted to sell a few things, but their fees are impossible and anything that you create as a niche on Amazon will most likely be sold by Amazon in a matter of months, or right before you make any significant money, because they steal every market that is created on their system. I even considered having them ship and store products for me, but they it is like paying them rent to steal your business because if your business is any good at all, (and they will know from the data), they'll just sell the products themselves at a lower price. Running my own website works, but having to field tons of calls from people who don't know what they want can drive you crazy. With the advent of smart phones people have gotten dumber because they don't read the information that is posted on the web since their screen is too small. Now most of the answers I have to give on the phone are like, "Have you gone to the website?" or "If you click on the item you will see more details about that product". I am the first to admit that my website isn't organized that well, but I have noticed a decline in the relevance of the types of questions I get that will actually influence a sale with the increase in the popularity of smart phones. Wholesale margins have shrunk over time and even the cost of fees charged by the credit card processors and website hosting services have a significant effect on transacting wholesale business online. I was glad to hear that the credit card companies are being forced to pay a large settlement, but there is no way to get ahead of system when it comes to fees and charges that drive a company into the red. Fraud is the other problem with the internet and although there are ways to reduce credit card fraud it is a constant battle. For example, some of my largest orders in the past have been to international companies in Australia, France, Germany or Japan, but in order to do a wholesale order I only do wire transfers. Well in order to get a wire transfer you have to give the person your bank information, which is risky in and of itself. There is not way to stop a chargeback with a credit card, so that is a bad way to do international business and checks, well let's not even go there. It is hard to trust anyone when it comes to international orders and in the end it is easier to just ignore this large potential market than to take the risk for such small markups.Trade shows are outdated, but I still feel the need to go to them every now and again as both a buyer and seller. There are other markets these days like eBay, Etsy or even your own website, but the fashion business still seems to be stuck in 2nd gear and thousands of people march around the world to trade shows all year around in the hopes of finding something somebody else hasn't already found. The money and expense of the booth, the travel and the display all add to the cost of these products. When the internet was evolving, I thought trade shows would die out quickly, but instead they are dying a slow agonizing death. The internet has not completely replaced the tactile nature of picking up and seeing products first hand, but still there are fewer and fewer people attending most trade shows as buyers and sellers. Wholesale margins have shrunk over time and even the cost of fees charged by the credit card processors and website hosting services have a significant effect on transacting wholesale business online. I was glad to hear that the credit card companies are being forced to pay a large settlement, but there is no way to get ahead of system when it comes to fees and charges that drive a company into the red. Fraud is the other problem with the internet and although there are ways to reduce credit card fraud it is a constant battle. For example, some of my largest orders in the past have been to international companies in Australia, France, Germany or Japan, but in order to do a wholesale order I only do wire transfers. Well in order to get a wire transfer you have to give the person your bank information, which is risky in and of itself. There is not way to stop a chargeback with a credit card, so that is a bad way to do international business and checks, well let's not even go there. It is hard to trust anyone when it comes to international orders and in the end it is easier to just ignore this large potential market than to take the risk for such small markups. Even though there are new and interesting ways to market products the benefits of seeing a product firsthand and meeting a company, before you do business with them, still seems the safest way to keep the ball rolling with wholesale clothing companies. Admittedly I still order from the same companies that I have dealt with over the years, at least the ones that are still in business. My business model has changed, but I have not been able to duplicate the success that I once had in wholesale, by attending trade shows, with my wholesale enterprise through the internet. Simultaneously my expenses have decreased too, so I also don't have to go to a show and make huge sales just to survive, but I do miss those big paydays and larger orders. The margins of dealing online with 3rd party companies that are also competitors has changed the game to where processing cost and shipping are the largest expenses in business. Fraud is a limiting factor and finally even if I find a great product by attending a trade show, the larger companies also find these products and buy out the stock with their deep pockets before I can get a decent market built for the product in my retail store or online. This makes it impossible to profit from products that are a "hit" since you can't get them when you need them. The only way to profit from the next "Big Thing" is to make the next "Big Thing" and control the production. This could be through private labeling or through production of unique items, but there isn't a easy way to profit by just reselling and stocking fashion and accessory items that aren't commodities like blank t-shirts. Every year when the Magic trade show rolls around I get anxious. I haven't exhibited in trade shows for years and have limited my wholesale activities to t-shirt printing jobs, blank t-shirts online and a few stores that buy my designs from time to time. Still it is as if the call of the wild is in my bones and I start making things every summer as if I was going to go to the trade show and exhibit my products and be a huge success all over again. When push comes to shove I don't spend the money on a booth and attempt to get some other company to carry my stuff, which never really works out. Nobody will sell my products like I would and by the time everyone involved gets a piece of the action it just doesn't seem worth it. The draw to trade shows like Magic is to increase the volume of production for some of my products so that I can crank up my capacity and have a steady stream of orders instead of the stop and go that comes from only selling retail. Originally the store in Los Angeles, Y-Que was to be like a wholesale showroom so that I can avoid trade shows altogether, but now it is pretty much retail with a few racks in the back for the wholesale t-shirts I sell online. I have been mixing my techniques and have been making a bunch of different products/things that are almost ready for market, but it takes thinking about a trade show and actually selling these things to finish them and make them presentable. That is one of the best uses for a trade show is to get products finished into a form that customers may indeed consider carrying in their own store. 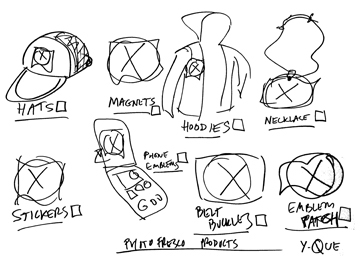 Here is a scribble image of the assortment of products and accessories that can go with some of the same t-shirt designs that I currently print. I often make things that are decent, but the finishing touches are missing when I put the items on the shelf and sell them one at a time in Y-Que Trading Post. Sure it's fun, but it's not the same as putting it on a table in a 10 X 10 booth and standing next to a limited number of products while analyzing the gaze of potential buyers to see if they think my "items" are the next big thing. This process is one of the few ways I have made things that I could actually sell to other companies and without that inspiration my products sort of float around the retail store until the sample is gone or broken. This year I need to break the cycle and approach wholesale manufacturing again, but use the store as if every day is a trade show. My products are almost ready for the market and if I catalog and clean up the loose ends I think I can make a consistent presentation for potential customers that do come into the store looking for the next "thing". My product line includes an assortment of image based products that I have turned into t-shirt designs, key chains, mesh trucker hat designs, magnets and stickers, the usual suspects in a pop-art line of products for retail gift stores. I'll post a sampling of the concepts here just to get the ball rolling. As far as t-shirts go the main development is to break down the designs into an interface that will allow my retail customers (or wholesale buyers too) to be more particular in their choices by selecting from a wide range of t-shirt brands when purchasing a design. These days everyone is a critic and the availability of fitted and standard cut t-shirts is overwhelming, but most people are very determined to get the exact type of shirt they want. I need to make that happen in my own little world in order to satisfy the demand for different shirts in different markets for different people with my designs. In fact some designs work better on some shirts than others too. Most people have switched over to fitted t-shirts these days which I call the trendy styles, but older people, 30 years or more, still tend towards the standard cut t-shirts. Young Men in the urban market also go towards the standard cut and larger cut t-shirts like the Alstyle 1301 which I call the skateboarder styles. There is no easy answer for all the reasons why some people like one t-shirt brand over another, but one thing is for sure and that is you can't just offer one type of shirt and think that it is going to work in all markets. Plus people need more information about the t-shirts that they are ordering these days so that they are comfortable with their choice. Nobody wants to be surprised about the fit and color of an item once it shows up in a package at their home or office. The cost of reshipping, making and the time involved are all wasted if a customer does not get the right item the first time. My goad has been to resolve this without resorting to t-shirt transfer printing, which is an option. I have been modifying Ekay.com to include a wide array of designs, but to also include a Brand Selector. Within each t-shirt design there is going to be a choice of brands and even styles within some of the brands, so that customers can drill down to find the exact style, within reason, for any t-shirt graphic design that I offer. Check it out and excuse the dust while it is being developed. This is sort of my trade show for now. I've been looking for a product that I could promote with a Free T-shirt deal online and I have finally found it with the Ting Mobile Phone Provider. Currently I have an affiliate relationship with the cell phone service provider and if a potential customer clicks on the link I provide, like this one here: https://ting.com/r/vtimr91 then the user will get a $50 discount coupon to be applied to their service. The details of the service can also be found at that link. In turn I would receive a credit for encouraging potential customers to check out the phone plans that Ting offers. My idea is to also provide a free t-shirt to the users who actually convert and sign up for the Ting service as an added bonus. Check out the details of this free t-shirt deal here: http://nocontractphoneservices.com/free_t_shirt_offer_with_Ting_Cell_Phone_Service.html or go here to read more about the No Contract Phone Plans that Ting offers. The following is a list of links to my updated t-shirt design interface. These webpages are hosted on ekay.com and serve as a based for the designs sold by yque.com and Y-que Trading post in Los Angeles. I have been working on a T-shirt app with my son and except for the descriptions and specifications that are required by the Android App Marketplace it is ready to go, so I have been updating the design interface online so that it will match this App. The entrance page for the t-shirt designs is at Ekay.com and basically it is a grid of current designs that we have available in Los Angeles. The idea is to offer a variety of colors of shirts for customers to preview how any particular graphic t-shirt design will look on a variety of shirts. These images lead to the design interface where the background shirt can be changed. If someone clicks the text under the graphic of the design then it will take them to the shopping cart online where they can purchase the t-shirt. Production time is still an issue because our normal turnaround time for blank t-shirt orders is 3-4 days, but since these shirts have to be made to order it is typically 1-2 weeks. I will work on this as the traffic picks up and if the designs seem to be selling more, but for now it is faster if the stock color, the one shown on the shopping cart, is the color that is ordered. Still 1-2 weeks for a made-to-order tshirt seems pretty good to me. Here is the list of active designs: Pluto Never Forget in black ink for light t-shirts Powered by Pancakes t-shirt Generic Turntable Record Player t-shirt Moog Keyboard t-shirt Platypus T-shirt design Available for Filming t-shirt Guitar Amplifier t-shirt on black and so on. I'll add more links later, but this should give you the idea. The t-shirt app we are making is basically a phone version of the shirt color changing mechanism and it will allow the user to flip through the colors quickly by tapping and change the design by swiping the screen. T-shirts without tags - Is there such a thing? This new image is an example of the simple printing that Y-Que does, but if you go to Ekay.com you can see the modified t-shirt design interface and see how this design looks on a wide range of t-shirt colors. Gildan buys Anvil - How does this affect you? Gildan buys Anvil for approximately 90 million. Sounds like chump change for a major brand, but what do I know. Things may have been tougher for Anvil than we realized. Although I like and promote many of their shirts, I didn't think they were a takeover target. If anything I considered Anvil to be a bit of an upstart with innovative lines attempting to do for t-shirts what American Apparel has done for marketing. The construction is always missing something with Anvil, but the same can be said for Gildan t-shirts. I sell more Gildan t-shirts than I do Anvil, but that is mostly a price issue. I just hope that some of the new lines of organic t-shirts are not discontinued. Also, I am hopeful that the new USA made Anvil shirt gets off the ground with more production so there can be more inventory in the pipeline. Better Gildan did this than anyone else. The new T-shirt Swatch Catalogs are here - Yipeee! I now have the complete selection of color swatches for the following brands of t-shirts: Anvil, Hanes, Gildan, Fruit of the Loom, Bella Canvas, Jerzee and my new favorite Next Level Apparel. I will be posting these colors with references and links to allow a broader selection and choice for t-shirt colors from these brands. Colors are everything when it comes to t-shirts, even with Organic t-shirts the colors are getting better. Anvil is attempting to be a leader in Organic t-shirts and let's hope they pull it off because it has not been easy getting exactly what people want when it comes to an environmentally sensitive garment. Next up, Swatches, everyone.